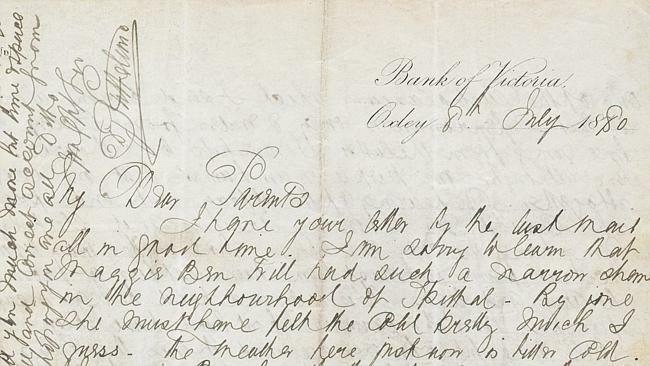 A closer look at theletter written by Donald Gray Sutherland to his family on July 8, 1880 which gives great detail about Ned Kellysoon after the siege at Glenrowan. A MAN who witnessed Ned Kelly’s capture at Glenrowan was haunted by the charred remains of the Kelly gang and the bushranger’s wailing sisters cradling him. 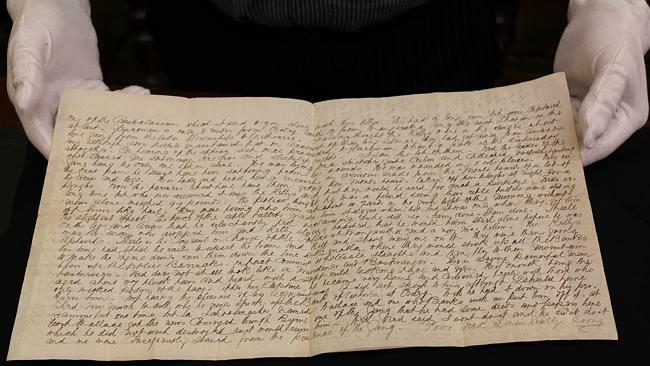 Donald G Sutherland’s previously unknown letter containing a dramatic account of the capture of Australia’s most notorious bushranger 133 years ago has been donated to the State Library of Victoria. The Scotsman wrote the letter to his family on July 8, 1880, and in it he gives great detail about the bushranger soon after the siege in north east Victoria. Sutherland’s descendants have handed the letter to the State Library where it has been described as a significant addition to the Kelly story. Sutherland says the handsome bushranger didn’t look like a killer. Descendants of Donald Sutherland have donated the letter to the State Library of Victoria. “Ned does not at all look like a murderer and Bushranger. He is a very powerful man aged about 27 black hair and beard with a soft mild looking face and eyes. His mouth being the only wicked portion of the face,” he wrote. Sutherland sailed to Australia in 1876 when he was 24 and worked at the Bank of Victoria in Oxley, 13km from Glenrowan. “On hearing of the affray I at once proceeded to Glenrowan to have a look at the desperados who caused me so many dreams and sleepless nights. I saw the lot of them. Ned the leader of the gang being the only one taken alive. Ned Kelly in chains, 1880 Picture: State Library of Victoria. “He was lying on a stretcher quite calm and collected notwithstanding the great pain he must have been suffering from his wounds. He was wounded in 5 or 6 places. Only on the arms and legs. His body and head being encased in armour made from the moule boards of a lot of ploughs. Ned’s infamous armour protected the bushranger until the police began firing on his legs. 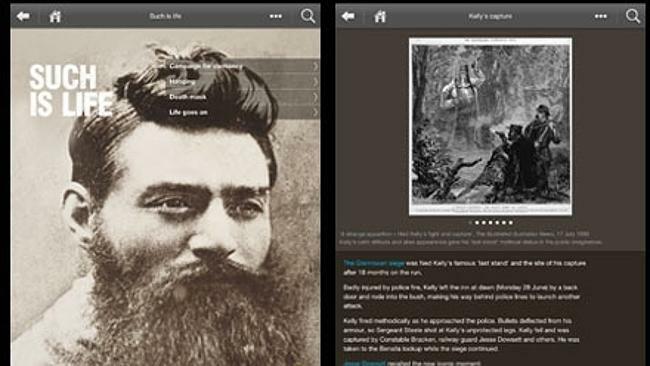 A look inside the Discover Ned Kelly at SLV free app that is available on Android devices via Google Play and is also free to download from Apple’s app store for both iPhone and iPad. After his capture, the sight of his sisters wailing and cradling his head stayed with the 24-year-old bank employee. Sutherland also said he saw the charred remains on Steve and Dan Hart. 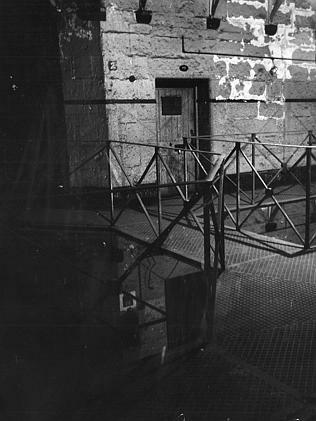 Ned Kelly took his last steps across the catwalk from this condemned cell at the Old Melbourne Gaol. A lock of hair from Ned Kelly’s horse was enclosed with the letter. Sutherland noted the horse was Kelly’s “favourite mare who followed him all around the trees during the firing. He said he wouldn’t care for himself if he thought his mare safe”. State Library of Victoria chief executive Sue Roberts says it’s a remarkable document. “This letter is a very personal account of events that have become part of Australia’s folklore,” she said. The letter will be on display in the State Library’s Changing Face of Victoria exhibition from Monday. 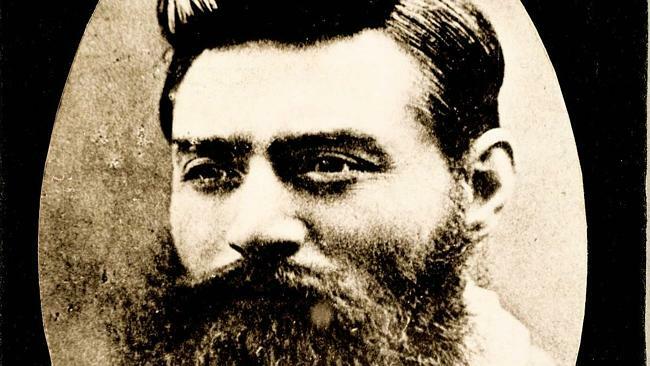 A TIMELINE of events in the life of famous Australian bushranger Ned Kelly. June 1855 – Australian bushranger Ned Kelly was born at Beveridge, Victoria, to Irish parents John “Red” and Ellen Kelly (nee Quinn). December 1866 – Kelly left school after his father died to assist grandfather James Quinn with the family cattle runs in northern Victoria. The Kellys and Quinns were often in trouble with police over cattle and horse theft, but were never found guilty. 1869 – Kelly,14, was arrested and served seven weeks in jail for the alleged assault of a Chinese pig farmer. It was also alleged Kelly was an assistant to thief-turned-bushranger Harry Power, although police found no evidence to prove a connection to Power’s crimes. 1870 – Kelly was jailed for three years after assaulting a hawker and being in possession of a stolen horse. He claimed to have borrowed the horse from Isaiah “Wild” Wright and did not know it was stolen. 1878 – Angered by laws he believed victimised the poor, Kelly allegedly shot Constable Alexander Fitzpatrick in the wrist after becoming too friendly with his sister Kate. Kelly’s mother Ellen was sent to prison for three years after Fitzpatrick gave an inaccurate report. Fearing the police wouldn’t believe their account of the events, Kelly went into hiding at Stringybark Creek with his brother Dan. A shoot-out began between the brothers and police and as a result three policemen were killed. After the shootings the Victorian Government declared the outlaw of the gang and offered 500 pounds for each of the gang members, alive or dead. A month after the shootings the Kelly gang committed major robberies of National Bank branches at Euroa and Jerilderie. They held police and civilians hostage while stealing all money from the bank’s vault. At the Jerilderie robbery Kelly wrote the famous letter telling his side of the story including the ill treatment of his family and the Irish Catholics by police. 1879 – The Kelly gang created their famous armour made from metal plates. June 26, 1880 – The gang’s outlaw status expired and Aaron Sherritt, a friend-turned-police informer, was shot dead by the group. The gang, who had since held 70 people hostage at the Glenrowan Inn, became aware a train transporting police to their location was on its way. Kelly ordered the tracks to be ripped up to cause a derailment. The attempt failed after a hostage escaped and alerted the authorities. June 28, 1880 – A shoot-out erupted between police and the gang that continued for almost half a day. It left Kelly seriously wounded, and killed all other members of his gang.. True Kelly Gang afficiando, history buffs and students can also learn more about the life and times of the nation’s most famous bushranger through a new free app developed by the library. Discover Ned Kelly at SLV contains over 60 pages of documents and photographs which cover the gang’s early influences, their outlaw careers, the siege, Kelly’s trial and his place in Australian folklore. The app also includes rare material on the Kelly Gang and 220 zoomable images for users to explore. 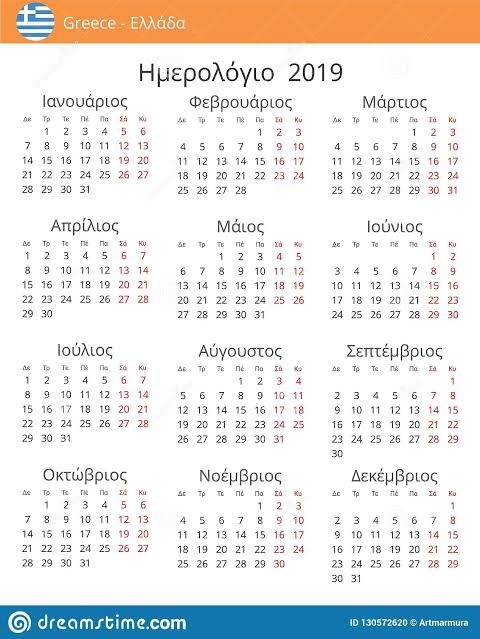 Previous Previous post: Has Today Tonight presenter Helen Kapalos put her foot in it again?